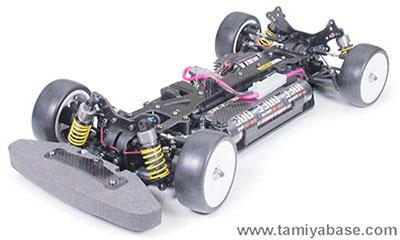 This is the third evolution of the TB chassis featuring a shaft-driven 4WD transmission and a centrally placed motor. To increase speed and handling, suspension geometry has been modified. Front and rear gearboxes have been downsized to reduce weight. Moreover, full ball bearing employment, front one-way unit and rear ball-diff have been mounted to reduce power loss. Motor and battery arrangement has been modified in order to make battery weight compensate motor torque to achieve better stability. The aluminum suspension mounts allow setting of skid angle.